Last summer I was asked to contribute material to a new book: Beyond the Plate. I created a brand new recipe, submitted an old reader favorite (Italian almond ricotta cake– so good! ), and answered a few Q’s and A’s about life in the kitchen. The book features over 60 mouthwatering recipes and interesting stories from top food blogs around the world. I’m honored to be included. The foreword is by Saveur’s Editor-in-Chief, Adam Sachs who poses the relevant question: Is blogging dead? No, my friends. It’s not. And this book proves otherwise: it will make you think, make you hungry, and most of all, it will leave you inspired. In fact, if you can imagine a massive potluck party bound together by paper and string this is it. You’ll love flipping through the pages wondering who’ll you’ll discover next! Besides salivating over the recipes, you’ll get to learn more about the blogger’s themselves. Brook Bass from Chocolate + Marrow– who is currently sailing around the Caribbean with her husband on sailboat– can’t live without a tiny whisk which was a gift from her hair stylist. Emma Galloway’s ultimate comfort food is Aloo Matar with rice, which I actually had to Google because I had no clue what that was (but I want it for dinner). This book certainly encompasses all things beyond the plate. I’m giving away a copy so you can experience the fun for yourself! 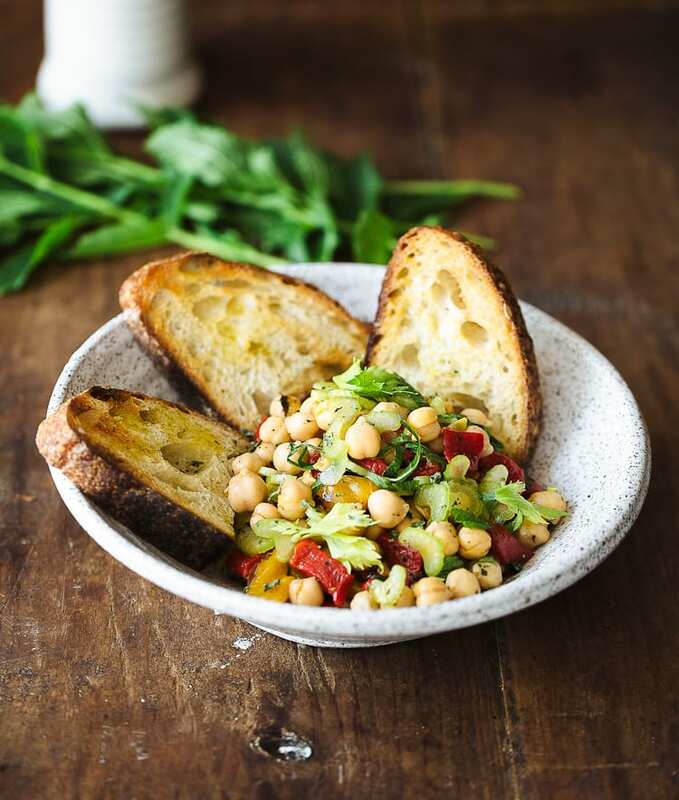 One lucky winner will receive a beautiful hardcopy filled with journalistic-style photos and recipes, including this chickpea number with toasted sourdough. To enter, all you have to do is leave a comment below: Why do you like to read food blogs? Is it for the recipes? The stories? Or both? CONGRATULATIONS TO OUR WINNER, BEVERLY HART PRESS!! I absolutely LOVE the recipes, but it’s a great way to see ways others live all over the country, even the world. It’s really great learning experience for me! I enjoy food blogs for all the reasons you stated. The stories bring the food to life and the interesting combinations of ingredients each person has is inspiring for people to get out of their ruts. I would love to win this book and share the recipes with friends over good wine. I read food blogs, particularly yours Emily, in search of inspiration for my own meals. The recipes are critical however, like discovering a new wine region or style of cheese making -they are not the same without the story. Thank you. I love reading food blogs. I get such great recipes and ideas from them. The stories associated with them are also fun. I like to read food blogs because I love food, cooking, inventing and more importantly eating it! I like blogs for both of the reasons you listed. The recipes are great but sometimes hearing about life is just as nice. I enjoy reading recipe books and food blogs because they tell a story that has meaning to the food they write about. It makes me feel closer to the heart and soul of the recipe. Which always makes the food taste so much better and enjoyable. Besides all the beautiful photographs and delicious recipes it’s a great way to learn more about the author. Which brings the chef right into my humble kitchen. I love to read recipes and blogs. You can get the feel for the recipe and the love it is made with. I love to travel. I’m a travel agent, so I love to read blogs about food from other cultures. Blogs give us all an insight to people’s passions from all over the world. I love to read the creative recipes plus learn about the person behind the blog. “travel is the only thing you buy, that makes you richer’…….. Thank you! I love your cookbook! I like to read food blogs because I like to read how the recipe comes alive. The way the blogger writes about the food, as if I can almost smell and taste it. I’m very visual and if the blogger is good at what they do, cooking and writing, then it’s like I’m siting in their kitchen as they make the plate just for me. I live alone and Bloggers with their stories feel like family. Love the recipes also because I’m always looking for something new to try. Passionate & creative people sharing recipes, stories & techniques. I’ve learned so much by reading them while being entertained. For me, reading food blogs provides an amazing opportunity for learning about food stories, traditions, journeys, inspirations. Then when I try new recipes from the blog I have a different connection to the food I am preparing and it feels as if I am connected more to the author and it feels more heartwarming. I read blogs for inspiration and for keeping me updated on methods and ingredients. I appreciate the personalities behind the recipes, I like the positiveness, and, for some reason, a it actually gives me hope in our world. Reading blogs is like having a friend tell you about their recipes. I enjoy reading food blogs for the recipes – of course – but also to learn about the inspiration behind them. It gets me into the creative spirit to concoct something new in the kitchen! I love to try new recipies and to get new ideas of what to cook or new methods to try. I love to find recipes that can become family and friend favorites. I love reading food blogs primarily because of the awesome recipes ideas and lovely photos. Once I find a blog with trusted recipes (like your blog :-)), I start following the blogger and their everyday adventures :-) Many of the blogs I follow include parenting and travel posts which is so much to read about. For me I believe its two parts. The recipes of course are the enticing portion which draws me in. However the stories shows us the sense of passion, the love of food and the gathering of love and family which is the core to our well being. Its what draws us all in together! I love reading food blogs because it takes me into the world of food, which is a world that makes me so so happy! There is nothing more pleasurable than curling up with a new cookbook or opening a new blog email and reading all the recipes step by step. Each cookbook/post teaches me more and more about the world of food which continues to evolves recipe by recipe thanks to the genius and dedication of all the wonderful food bloggers, chefs and cookbook authors out there. You ask if I prefer the stories or recipes, but they are all both stories to me!!! I’ve always been a cookbook girl and am quite new to the world of blogging; a blog gives you so much more sense of the person and because there are new posts on a regular basis, it’s like you have your own great foodie friend sending you special, personal updates on what’s new and delicious in the world of food. And I’ve just snacked on a piece of fresh sourdough that your blog helped me to make… Thank you! I read food blogs in hope of finding something new. Learning techniques or getting ideas. I may not always cook it the way it is but it inspires me to make the dish my own way. I enjoy reading food blogs because I find them entertaining. I like to see the beautiful photos which take a lot of work and talent to produce. I am inspired by the recipes and stories associated with each post. When I am at a loss at what to cook for a meal, food blogs jog my motivation and solve my cooking block. I am a cookbook addict and I read a ton of food blogs! The blogs have a sense of community in the food world that is like no other. I am in the process of starting my own food blog and so many cooks and writers have been willing to answer questions and share their ideas which is amazing! I still love the actual cookbooks though and the feeling when a new one arrives and the need to read it cover to cover and then planing the week’s menu with flagged recipes! Cooking balances me and is a huge stress reliever. I love reading food blogs primarily because it helps me to stay on track with my healthy lifestyle. It’s so easy to slip back into old & bad habits and over the years I’ve discovered what works best for me is reading about others who are on the same journey as I am. Being immersed in blogs and reading of individuals with the same values, not only do I relate, but it keeps me grounded & inspires me, leaving me with a thirst to discover more. Love cookbooks and I even collect them and give them as gifts. Reading the stories of the authors and cooks are a favorite. I always note a favorite recipe in each book. My daughters have claimed some of my older ones already and I am sure this one will eventually go to one of my granddaughters. I love the content of food blogs. The recipes are great and sometimes they spark ideas on creating dishes. I love food, some people eat to live…I LIVE TO EAT!! There are so many things to love about food blogs! The recipes, step by step instructions with photos and stories of course. Food blogs have given all of us such amazing access to indulge in all of our food cravings! I read food blogs for the inspiring photos and recipes. They are are another window into creativity that can be eaten and enjoyed with family and friends. I used to love reading cookbooks and I still do, but now days I read more food blogs. They are so much easier to access. I am always trying new recipes and food blogs give me ideas. I can’t t afford to buy cookbooks nor cooking magazines. I like to cook but I cannot afford to buy exotic ingredients, most of which are not found in my grocery store in any case. If I find a blog that offers different yet wholesome recipes, I am happy to try them out. However the recipe may turn out, I am always thankful to the Lord for the food I eat. I get so much inspiration from food blogs! The gorgeous photos and creative recipes encourage me to get in the kitchen and play! :) Thank you for the giveaway! I love food blogs for the recipes and comments (and questions) that they generate. I read food blogs for all the incredible recipes and the bonus stories that are told. My family prefers to eat at home, thanks to the help of all the wonderful food bloggers that have taught me about flavor and food combinations. My homemade mains, veggies, sides, smoothies and not to mention all the awesome desserts taste delicious! If we are being honest here it’s the photos. I love dreamy food photos, and get a lot of my cooking inspiration visually instead of actually reading the recipe. I like to make my own recipes, but I also really love a well photographed cookbook. I like food blogs for both, but especially to discover new recipes. Your bread recipe is a staple in my kitchen, and has become famous in my small town. I started reading food blogs for the recipes but now I read many of them for the stories even when I can see the recipe is something that would not work for my family’s eating style. Wow, what an awesome concept for a book, so thank you so much for giving one of us the chance to win a copy of our own! Food blogs are one of my favorite things to read! Whether it be hearing about a food blogger’s family life and children, their struggles, their dreams, or their funny mishaps, I love it all! I especially enjoy reading about the stories behind each recipe and how the recipe came to be. Another highlight of food blogs (for me) is how they create a close community. Food blogs allow so many people to connect, relate, and bond over food and recipes! It’s pretty awesome to get to know the personalities, likes, dislikes, and stories of so many people through food blogs! And of course its great and to be able to use and explore different food blogger’s recipes, as well as use the recipes for inspiration. I love the blogs for the recipes and the AND the stories. I frequently will peruse the blog looking for examples of recipes I would like to try. The Clever Carrot is a wonderful blog both informational and wonderfully designed. Recipes, but above all the personality of the blogger behind it. Authenticity, warmth, those things matter the most to me. I also particularly enjoy bloggers who interact with the readers in the comments. I love the human aspect. I have moved around a lot and have connected to people all over the world through a shared meal or time in a foreign marketplace. I have been cooking since 1969 and learned to do it without many stories or photos. My first true inspiration that told stories with the recipes was Economy Gastronomy. It was accessible gourmet that a young cook could recreate. I started to see food differently and incorporated my experiences into my food. Now bloggers invigorate and inspire me and my learning continues. Emilee, I love fresh food. The effort that goes into the creative process really is something to blog about. It is an authentic celebration of food culture. The photos are rich and invite readers to bring food alive and into the home space to share and enjoy. I am so inspired! I like the stories, and the recipes aren’t bad! I read food blogs for inspiration and to get new recipes! I read for the food, the stories and the beautiful photography. I love food pics and cookbooks!!! Recipes and for cooking inspiration are the reasons I read blogs. I read for the recipes first, but if the stories are engaging, I keep coming back! I love the stories the most! But, I love the recipes almost as much–they are kind of their own story, right? I read food blogs primarily for the recipes or inspiration. I love seeing what others can do with simple ingredients. Plus, the images are always so pretty. everyday it’s an adventure into new cooking ideas and peoples lives. its like traveling the world without leaving home. I love the inspiration to try new foods and explore new recipes. Thank you! I love food blogs to inspire my own creations in the kitchen. The stories make the process real. They also help me with variations and get out of ruts in the kitchen! Keep writing!! Thank you! I read food blogs for recipes first and stories second. I’m always looking for new recipes to add to my repertoire. Mostly, I read for the recipes, but even more, I enjoy the personality of the writer and their imagination and friendliness. It is generous to share recipes and personal ideas, and I am grateful. I love the recipes. I don’t like making the same dishes over again too often so I gather new recipes from many food blogs I follow. But I’m also finding myself following along with some bloggers personal lives now since I read their stories for recipe tips. I love food blogs because I love food, and getting daily doses of inspiration from round the world is fantastic. The world’s cultures of food are truly fascinating and blogging makes this particularly obvious. Seasonal and local food are strong foci for me, and reading northern hemisphere blogs in the southern hemisphere winter makes my mouth water for summer. I really really love food, and reading food blogs is a low-calorie way of consuming food. I like to see what people are eating and trying. It’s fun to see another’s point of view. Also it makes me try some different ways to prepare food. I love reading food blogs for everything; the recipes, the stories, the photography, the styling!! I love getting to know the person behind the blog and be able to connect with them and share a mutual love of food!! I like to read food blogs mainly to find new recipes to make for my family. I also enjoy reading the stories at times, as it is like keeping in touch with a good friend. I love reading cookbooks and blogs. I find other people s stories interesting. I have learned so much about cooking. Seeing what people go thru and still manage to cook delicious meals. Different ideas from different cultures too, inspire me. I’ve learned to cook healthier. And I have a nice cookbook collection that I keep proudly displayed in my newly decorated chic cave in my house. Cooking and eating are such personal ways to connect: with one’s body, to others, to the source of food. So should recipes – the stories cooks provide via blogs allow us to connect to the story of the food and for me this inspires me to cook and create like nothing else! I read food blogs for inspiration in the kitchen. I’ve been introduced to so many great recipes that I might never if I had to rely only on cookbooks. I enjoy following along in the bloggers personal stories and travels. I enjoy the pictures, stories and the variety of recipes. One blog always leads to another and another. I always end up following them on Instagram also. Hello, I now read your blogs and most of the comments. I found your sourdough bread “beginners guide” recipe, followed it to the “T” and now i keep making this recipe because for a beginners bread maker your recipe and instructions made me a great bread maker. So, I feel I owe it to you to take my prescious time and spend it with you since you take your precious time and share with us. Just as JC said, I too enjoy the “dreamy food photos” for inspiration and for guidance to make sure i am doing things correctly. And, as SallyBR said, I too enjoy when the blogger interacts with “us” their followers. I love to read food blogs to try a new recipe and get a new inspired story to cook healthy and yummy meals for my family. I enjoy the story and appreciate home-cooked meals more because it’s how family spends quality time together to create a memory. I admit to being addicted to the flavors, pictures, and magic that is found in cookbooks. My children talk about the family dinners we always shared because their friends didn’t experience that. Christmas traditions for our family is all about the food. I can never live up to Granny in baking, but I’ll go to my grave trying. I love trying new recipes ! I like to read food blogs for the recipes, photos and new ideas, especially with foods I haven’t cooked before. Everybody has a story and usually it is centered around family, celebration and food. To have a food blogger share their life experiences through recipes that they have enjoyed putting together themselves or that have been passed down to them through the years is interesting to me. I think the story line adds to the blog and is really one of the reasons why they so popular at this time. The recipes are always a bonus and when presented in this way it makes me want to try them out! 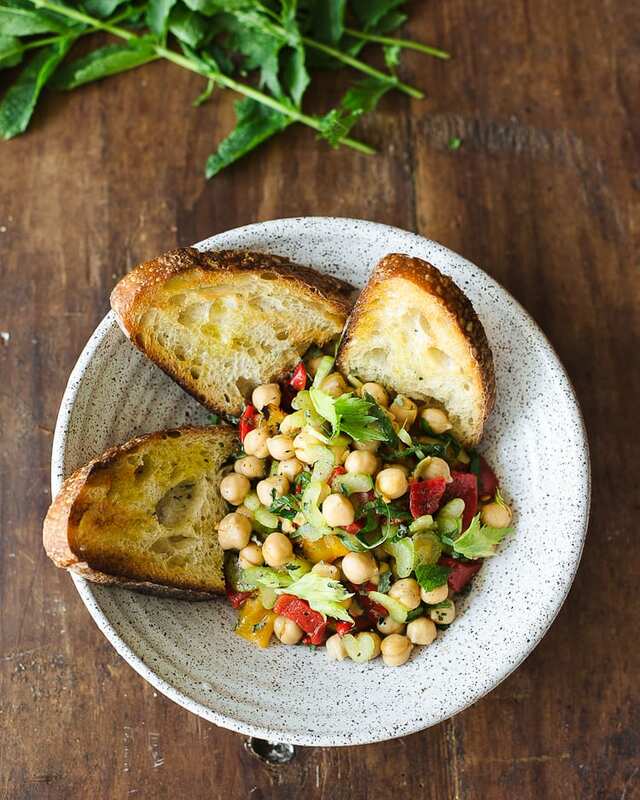 PS: Chickpeas are a favorite of mine as well! 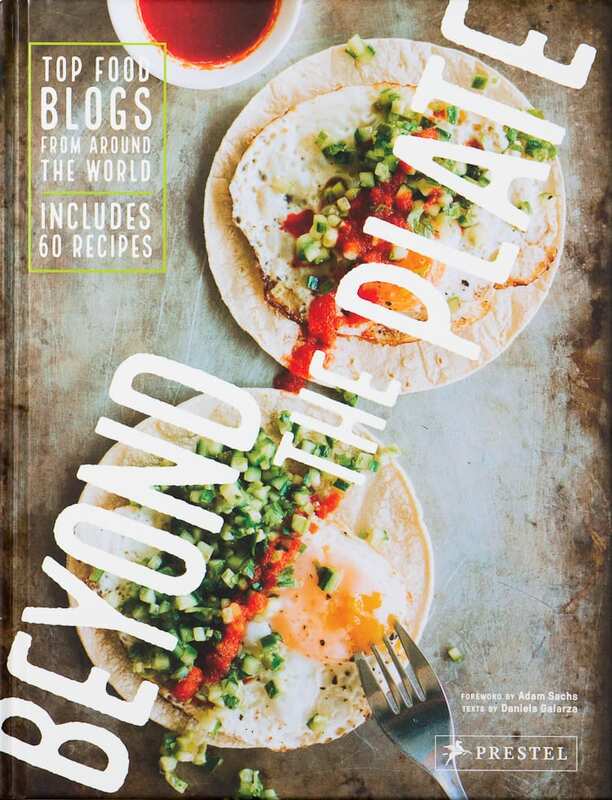 The recipe, the inspiration, the stories, exposure to international foods and culture…so much fun reading food blogs! I love ‘trial and error’ story for recipes. There are so many recipes and inspirations out there, but how to develop the recipes is a different story. It’s very unique and fun to read. I am a long time collector of cookbooks. I love to curl up in a cozy chair and read them. I fold down the pages of the recipes I want to try. It’s relaxing and inspiring. As much as I Pin recipes on the Internet, I sincerely love holding a new cookbook in my hands. The pictures are always fun and make me want to put an apron on! I discovered one of your recipes on the Internet and I was thrilled to know you had a cookbook. I am a new and happy owner of it. I especially love your innovative salads. They really take the mundane up many notches! The stories and the recipes! I love a good food tale. It can make the food better. I read blogs for both. I love the recipes, but stories make it more personal! I love food blogs as they inspire me to be more creative and more connected to others that love to cook. Food blogs for me let me see things beyond what I may try on my own. Bless all of you who help us reach further in our skill level! I like to read food blogs because they’re a great source of inspiration for daily life meals and it’s also beautiful to see all the art involved from the food styling, the food/produce, ceramics, etc. I love food blogs because they give me inspiration for meals. I get from food blogs. For me it is both — I enjoy the stories behind the recipes. And I love cooking new things – blogs have introduced me to recipes I never would have tried before. I also like getting to know the blog authors – many nice people too! Food Blogs not only give you recipes, but take you into the author’s kitchen so they can teach you new tricks, strategies, techniques, and on top of all this you learn about them! Love to read food Blogs.. They allow me to connect with like minded culanarians for both new ideas and learning about different folks in all different places!! I enjoy reading cooking blogs for both the recipes and the getting to know the life of the blogger. I have never been very technologically gifted, so when a blogger I particularly enjoy puts out a book, that is always my preferred method of cooking recipes: I like to have the book out on the counter as a constant reference while I am cooking. What a great idea to incorporate different blogger’s recipes in one book, maybe this concept will take off and we will see more! How about a compilation of different blogger’s recipes for certain types of foods, like a sandwich book or salad book? I love reading food blogs for inspiration and delicious and beautiful creations with food. I like to read them because it helps me create amazing meal plans week over week- it’s totally the food! I have so many favorite blogs (obviously yours!) in my feedly reader that I binge through and save to my pinterest for easy indexing later. Food blogs for me are like windows to the world. The sharing is truly enlightening and lets me into the lives of more people than I can possibly meet. Thank you for giving me the opportunity to learn, taste and bring alive the meals you serve in my home. I truly enjoy reading about what people eat. If they write about the experience and history surrounding the recipe that’s even better. I love reading both, stories and recipes. And, most of all, knowing different ingredients from all over the world! Love following blogs, I am not creative like that but I love to look and try new recipes! I like to read food blogs for recipes, new ingredients, new techniques, and product reviews. I like the recipes. Because I don’t have the imagination to make up my own recipes, I’m continually impressed with the meals food bloggers come up with. I did a lot of travelling in my younger days, and loved the excitement of new places, cultures and of course the food! Food blogs take me back to those days but from the comfort of my own home. I tend to follow blogs from other countries or from people who like to really think outside the box. And I love the recipes because I love to cook and try new ideas. Thanks for the giveaway Emily! I love both! The recipes and stories are my favorite! When time allows both..for stories. In general it’s the recipe and photographs that will draw me in. Always look to add to my collection of cookbooks and foods to make. Food blogs have revolutionized how I cook – I credit them and their wonderful recipes for helping me enjoy spending time in the kitchen! Food blogs provide a whole new perspective on how to prepare a meal. I love reading the history behind the recipes and finding out why each ingredient is so crucial to the resulting creation. This book sounds like such an awesome gift! And blogging is so not dead. I love reading blogs for inspiration and the stories. And it makes it so easy to connect with people all over the world! I’m kind of surprised he was questioning the vitality of blogging! Food blogs are where I go when I’m deciding how to make something gluten-free, or without processed sugars, etc. or just wondering how others have done a better version of a store-bought treat. Sometimes I’m just trying to figure out what in the world to cook for dinner. So, I read food blogs first for the recipes and then sometimes get hooked by the writing and consistently lovely food and subscribe, like with your blog. It’ s really great to learn one’s culture through food! I enjoy new recipes and get so much inspiration! Great work! I read food blogs for cooking ideas, and for getting a small glimpse into others people’s lives. A good food blog combines great recipes with interesting stories. Also, I love that Almond Ricotta cake recipe. I love that you don’t need a mixer (I have one, but don’t always want to use it) and it tastes so good. In fact, I’ll be making it for my uncle’s 76th birthday this weekend. Thanks! I have always loved to read recipes. I have borrowed cookbooks from the library to read the recipes and find out more about food and how it is prepared around the world. I enjoy the stories that go with food, whether it is this a family tradition, or how the dish received it’s name. Thank you for sharing your recipes and stories with us. The book looks gorgeous! Main ingredients (reasons why): I love people’s stories and love nutritious, easy to prepare food, so reading food blogs is FUN. Have to admit, I’d love to write one too so it’s very inspiring to see how different they are and why I’m attracted to certain ones. The icing on the cake? It’s the Love in the Food! Honesty, simplicity, wholesomeness sprinkled with quirkiness and mouth-watering pics. Love the receipes but the stories make the blog. I follow mostly for recipes and inspiration, but the writing and photos can be the difference between a blogger that I always read and one that I only occasionally check. I like to read food blogs because i love cooking. It is the happiest time in whole week.